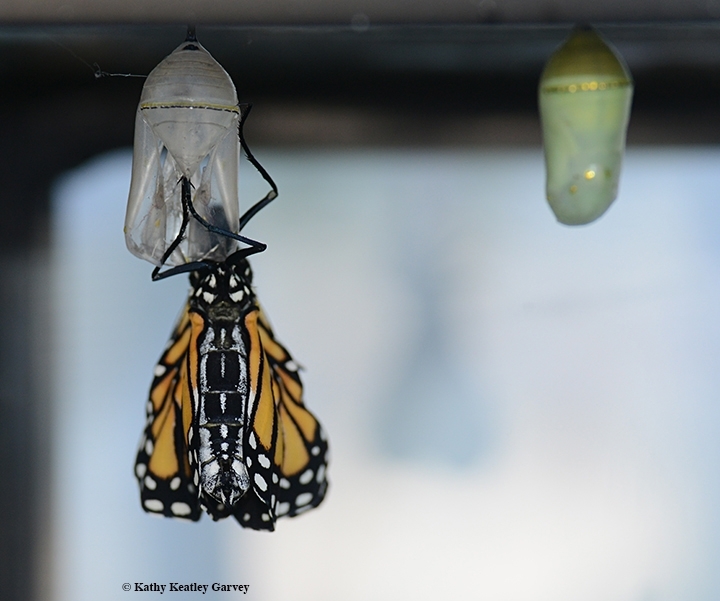 Have you ever seen a monarch butterfly eclose? 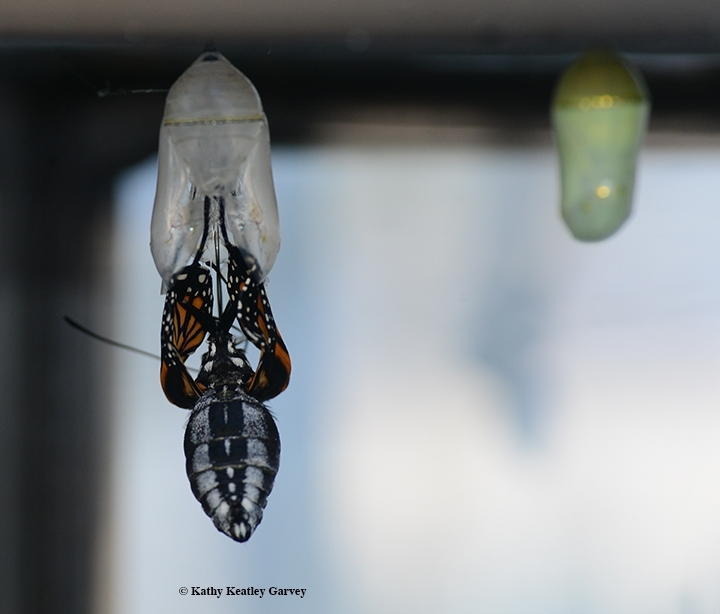 First an egg, then a caterpillar, then a chrysalis, and then a butterfly, Danaus plexippus. 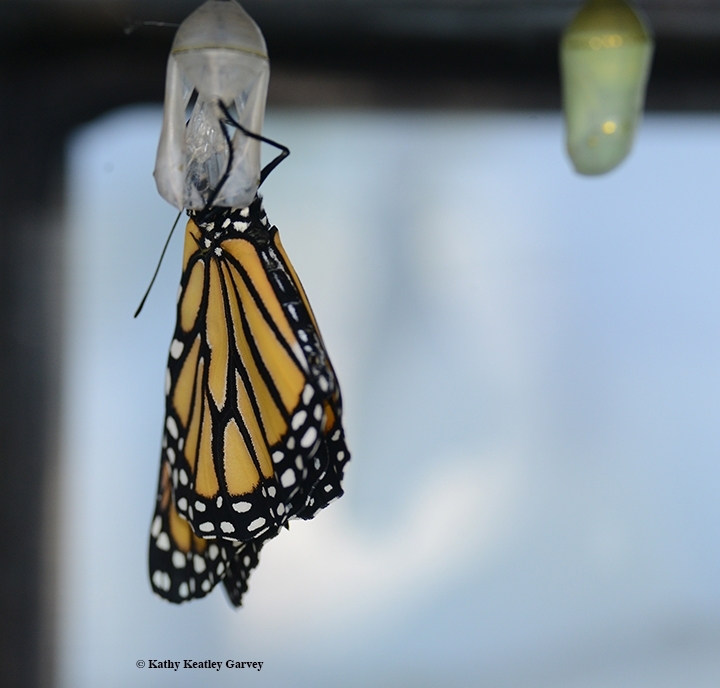 We took some images of a monarch eclosing back on Sept. 10, 2016. It was late in the season. While other monarchs were migrating to coastal California, some were fluttering into our yard in Vacaville, Calif., nectaring on blossoms, mating, and laying eggs on milkweed, their host plant. The caterpillar, from the first instar to the fifth instar, munches the milkweed like there's no tomorrow (maybe there isn't? 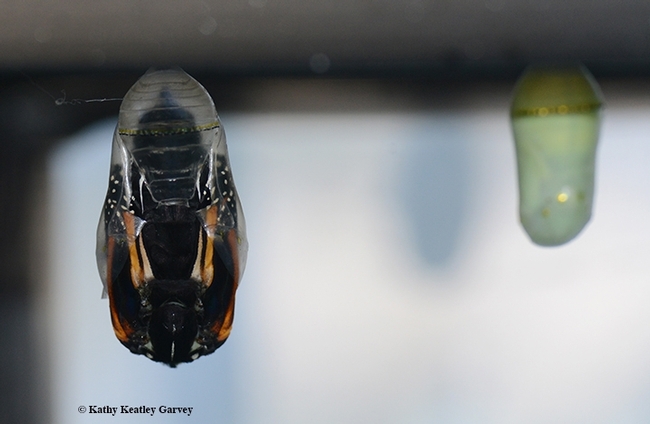 ), and then forms an emerald green chrysalis, dotted with gold that's reminiscent of royalty. When it turns transparent, you can see the familiar black and orange wings, a promise of what's to come. 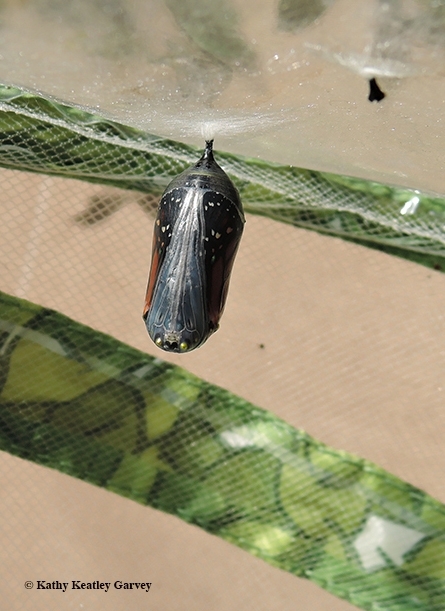 It takes about two weeks for an adult butterfly to emerge from its chrysalis and then it slides out--swoosh!--and hangs upside down, pumping fluids into its expanding wings. When the wings dry, off it goes. Sometimes it soars high into the sky. Sometimes it just lingers. 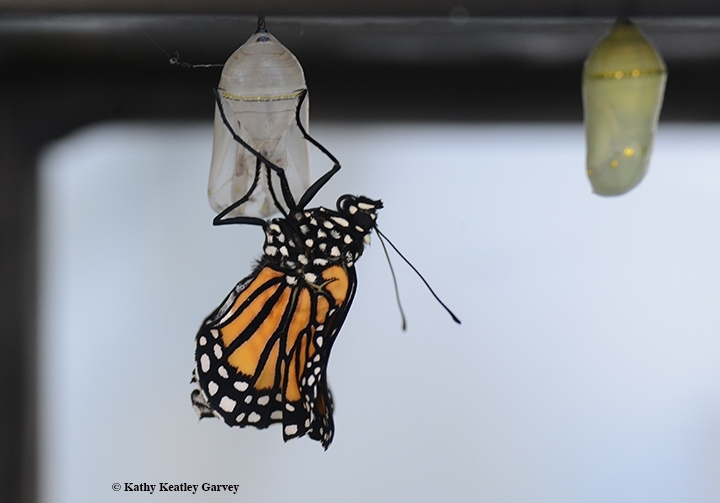 If you're a butterfly aficionado, you never get tired of watching that magical moment when a monarch ecloses. 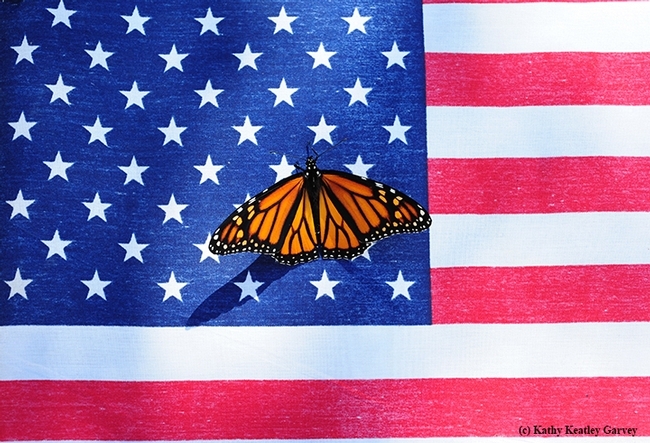 Here's to Independence Day and to America's favorite butterfly, the monarch. Today we celebrate the Fourth of July, also known as Independence Day. History books tell us that on July 4, 1776, the Continental Congress adopted the Declaration of Independence, declaring the 13 colonies a new nation and no longer part of the British Empire. 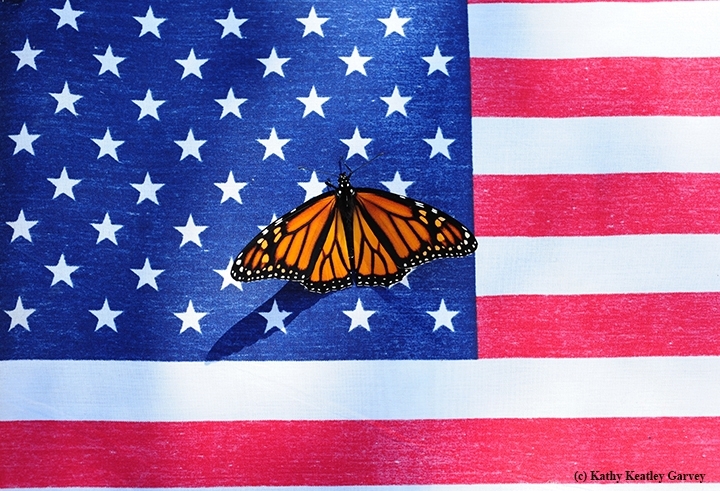 In the insect world--specifically the monarch butterfly world--independence day occurs with eclosure. The monarch wiggles from its chrysalis, dries its wings, and gains its freedom. 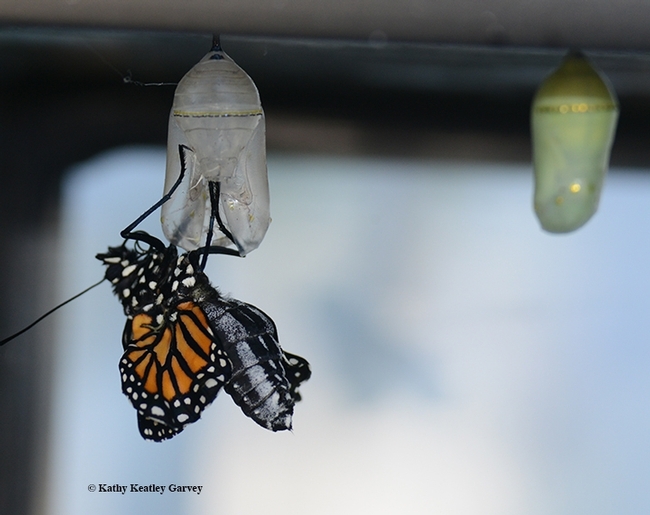 Metamorphosis is considered the greatest symbol of change, and indeed it is. 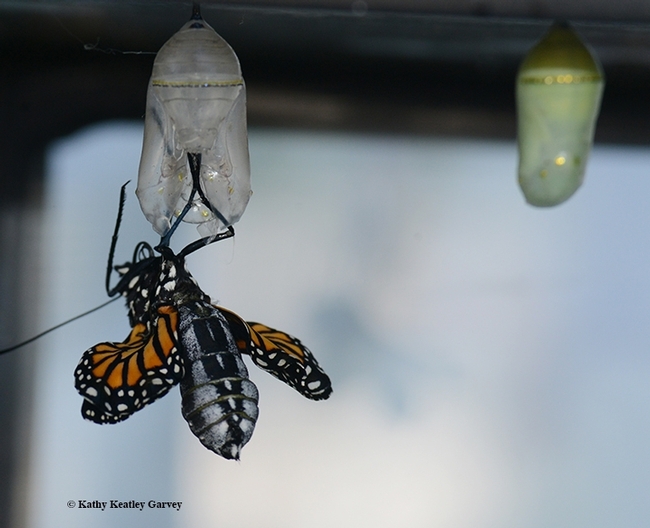 "What the caterpillar calls the end of the world, the master calls a butterfly." --Richard Bach. One more day until we celebrate the birth of our country, Independence Day, and the patriotic colors will be out in force. Insects, also, can be red, white and blue. 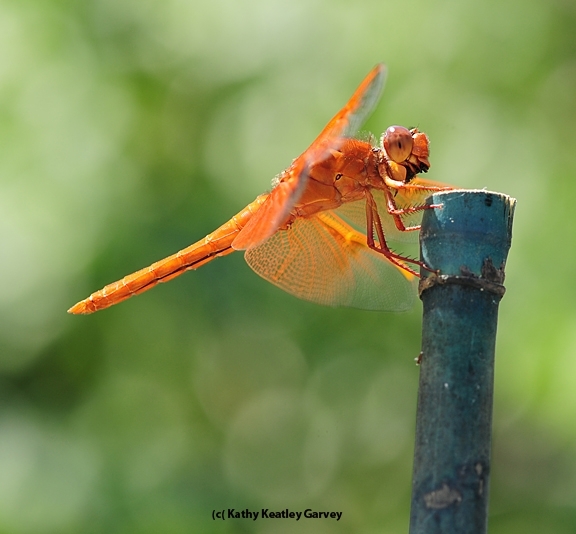 Take the red flameskimmer dragonfly (Libellula saturata). The male is firecracker red, as bright as the stripes on our American flag. 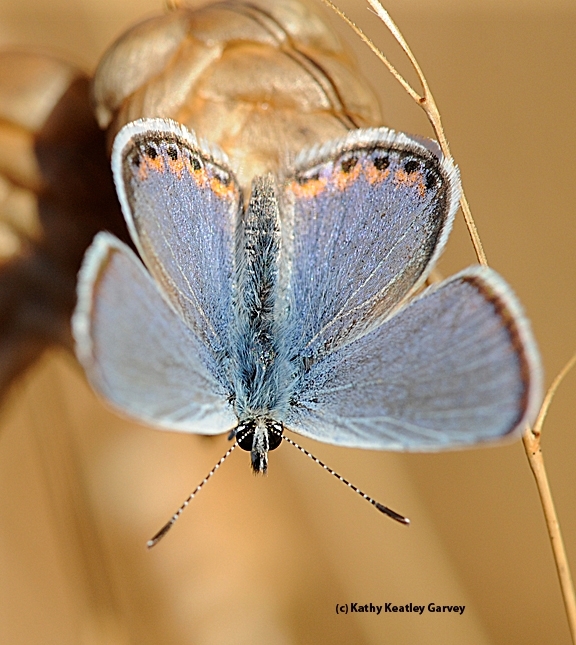 Take the Acmon Blue (Plebejus acmon) butterfly. It's as blue as the starry background on our flag. 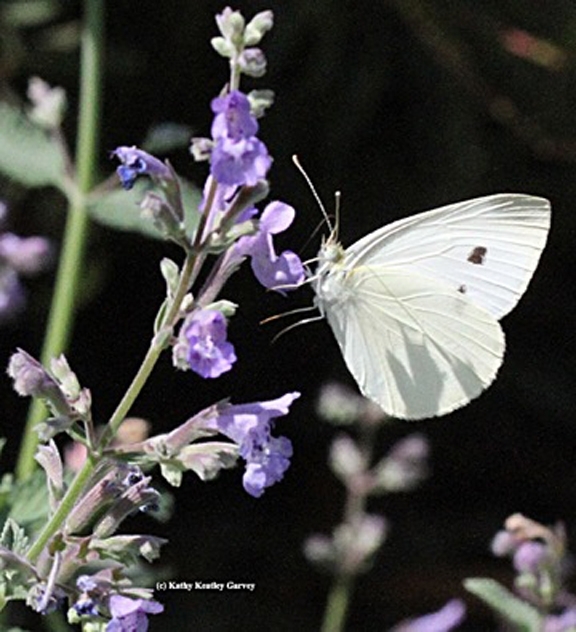 Take the white cabbage butterfly (Pieris rapae). it's a white as the stars on our flag. Okay, it's a pest, but its colors are appropriate on July 4. Just think, when the members of the Continental Congress adopted the Declaration of Independence on July 4, 1776, there were all those red, white and blue insects flying around. We mark the holiday with fireworks, family reunions, parades, barbecues, carnivals, picnics, concerts, baseball games, and the like, but if we look closely, the insects are there, too!